The heating cable is 18 feet long and is 110 V with a power consumption of 126 W. An automatic thermostat also controls the unit. Best answer Hello Glen, thank you for your question. Our Automatic Thermostatically Controlled Heat Cable can only be used on the outside of the pipe by spiraling it along the outside of it. 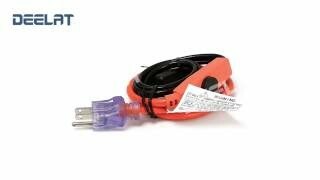 The cable has its automatic thermostat located on the orange section of the cable. It will automatically turn the cable on when temperatures reach below 6°C (42.8°F) and turn off when temperatures reach 13°C (55.4°F).